Often we are working, doing household tasks, watching tv, scanning social media or staring at screens right up until we put our heads on our pillows. It is common to feel like you do not have time to unwind in the evenings. However, to go into deep sleep, taking time before bed to decelerate from your day is imperative. This class asks you to let go of the incessant stimulation and activity of your day that often follows you right into your bed. Restorative yoga can help prepare your body and mind so that you can fall asleep easily and sleep deeply. When we practice restorative yoga at bedtime, we are teaching our mind and body how to rest. Instead of going over all the things that we have to do, our appointments, the things we fear we will forget, the things that have happened throughout the day, the conversations we had, we learn a different way. With restorative yoga for bedtime we learn how to come into our body and let go into the physical sensations of our body. Additionally we breathe deeply into our belly brain, a space that is far away from the thinking mind. 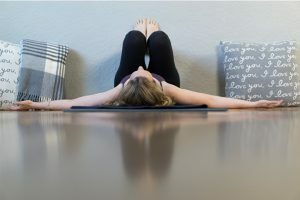 When we take time to engage in practices like restorative yoga for bedtime, we increase our ability to get restful, restorative sleep and decrease feelings of tiredness and irritability the next morning. Slowing down the body as we do in restorative yoga signals the parasympathetic nervous system, which favours sleep. Many times sleep eludes us because we do not slow the body down enough to enter the relaxed alpha brainwave states that precede sleep. 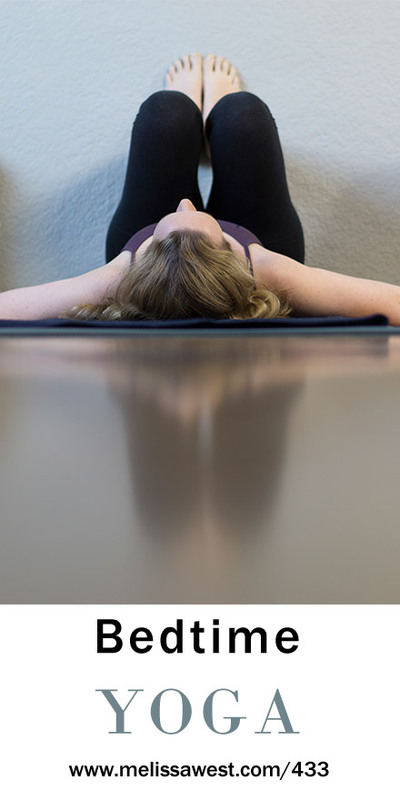 When we practice restorative yoga we reduce cortisol levels, lowering stress, which allows your body to move into relaxation and then sleep. When we let go of all the evening distractions we can draw our attention inwards. We can slow and deepen our breath. You will notice that your anxiety will diminish and that there is a quieting effect. Let this practice of restorative yoga for bedtime be restful and spacious. Dim the lights, turn off as many electronics as possible and simulate dusk. Draw your attention back from the scattered activity of daytime concerns, inward to the quiet focus on night. As my favourite expert on sleep Rubin Naiman says, “falling asleep is a gradual process that begins long before bedtime.” Let yourself settle down gradually with the sun. Let yourself slowly descend the way darkness gradually covers the night sky. Restorative yoga for bedtime can be a gentle, progressive release of the day.